What makes the outdoors so great? Nature itself, or our nurturing and altering of it? 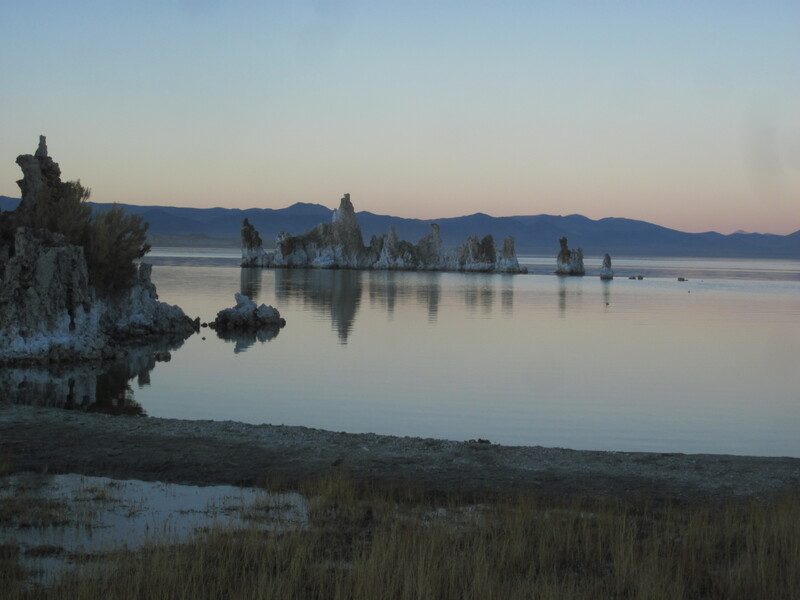 Mono Lake is the Eastern Sierra’s biggest and most famous lake, but it was drained significantly to bring water to the city of Los Angeles. Below the surface of Mono Lake, the centuries of volcanic bubbles created underwater stalagmites called tufas. Now the lake level is low, and these can be seen above water. They are indeed an incredible natural sight to behold, and we owe it to the City of Fallen Angels for draining the lake, inadvertently allowing these gorgeous outcrops to be seen. We generally think of nature as something apart from man. Sure, man lives in and observes it, but the things man creates –towns, roads, etc–is not nature. But this Thanksgiving, during 5 days in the environs of Bishop in California’s Eastern Sierra, I really realized how much man interacts with and creates what we think of as nature. The roads we bike, the trails we hike, the climbing bolts we clip–maybe those are just man made access to nature, and not huge alterations of nature itself. But sometimes what is created by man is indeed the central draw. Like Mono Lake’s tufas, for example. Or the ice at Lee Vining. 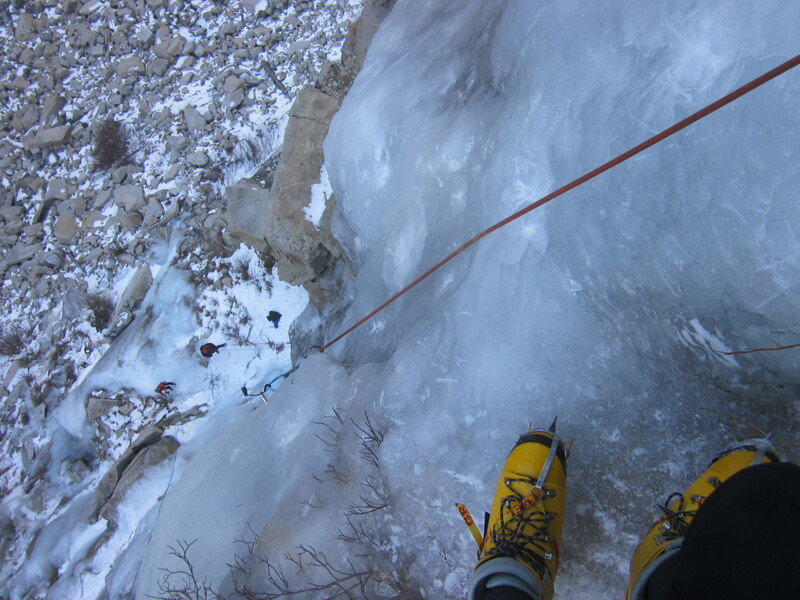 California’s –and in some sense the world’s– early developments in ice climbing gear stemmed from one small section of ice outside of Lee Vining in the Eastern Sierra. But this ice is not naturally occurring. 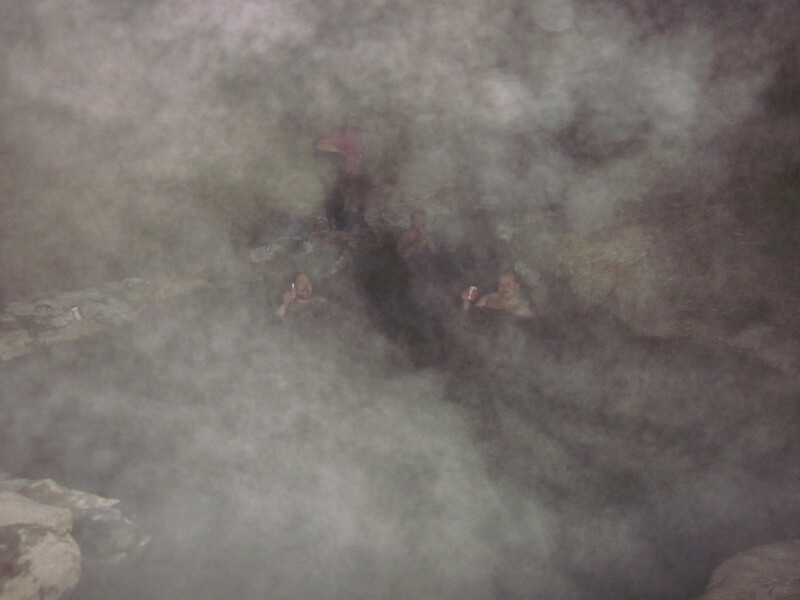 Climbers poked holes in a water pipe running to a power station to create a water seepage. Which turns into thick ice in winter. Yvon Chouinard forged new ice climbing tools and tested them on this ice. And now, Lee Vining is an establishment, a historical pilgrimage spot for ice aficionados. Of course some ice occurs naturally. But not much in California and so Lee Vining, a man made playground, is still the best place to ice climb in the state. Ouray, Colorado, America’s most famous ice climbing destination, also makes use of piped running water over shady cliffs to create ice. Grooming of ski slopes are another example of us altering nature. I opened the snowboarding season this Thanksgiving weekend at Mammoth, California’s biggest and most attitude-filled resort. But there was not enough powder on the mountain for backcountry riding. We had to stick to groomed slopes. Still fun, to be sure, but the chair lifts and indeed the lay of the snow on the mountain (and even the manufactured snow for the park’s jumps and halfpipe) is man made. I prefer to shred naturally, in the backcountry. But I get my practice first by using the chairlifts. Sport climbing is an obvious interference with nature, as the route must be bolted. This reality led to many bolt wars with some places, like Seneca Rocks, taking staunch anti-bolting ethics while others promoting the need to bolt routes. I’m on the trad climbing side, but I also think it is appropriate to place bolts in some cases. 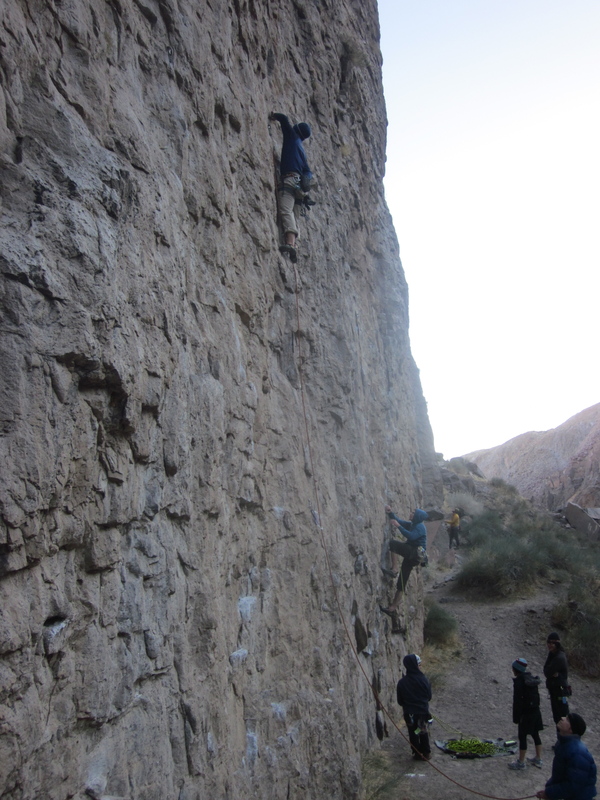 In the case of the Sierra, the best sport climbing area is Owens River Gorge. It is owned by the city of Los Angeles 400 miles away. They need the water. It would probably be a climbing destination without access on LA City-owned trails, but to make any sport crag you need to mess with nature in several ways. Chipping away and cleaning the rock to establish a route is definitely mandatory in the chossy volcanic soft rock at the Gorge. In Great Falls, a good rock crag in Virgina, the Park Service threatened to close various cliffs to rock climbing due to endangered plants and lichens. The outdoor enthusiast versus the preservationist. Luckily a closure hasn’t happened yet. By using the word lucky you can tell whose side I’m on. Still, I’m not crazy about bolting, and think some areas should indeed be protected. For instance, I don’t think high peaks should have iron and bolts installed. But I’m fine with bolting most generic low-lying rock faces. Really, the only nature-altering practice that I am vocally against is the altering of famous and important mountains (see this post for a story and long exposition of my opinion). But still, the wildlife and vegetation of nature are affected by the approach roads and towns created to access otherwise untouched mountains. So really, man has a role in all of it. Aside from chalk marks, bouldering has a pretty low impact on nature. Here Luke gets ready to send Molly, v5, at Bishop’s Sad Boulders. Now that I’ve pondered what it means to edit nature, let me be clear that the Eastern Sierra is an unparalleled adventure destination for outdoor sports, especially climbing. This 5-day Thanksgiving fest was my 15th trip, and there will be many more. 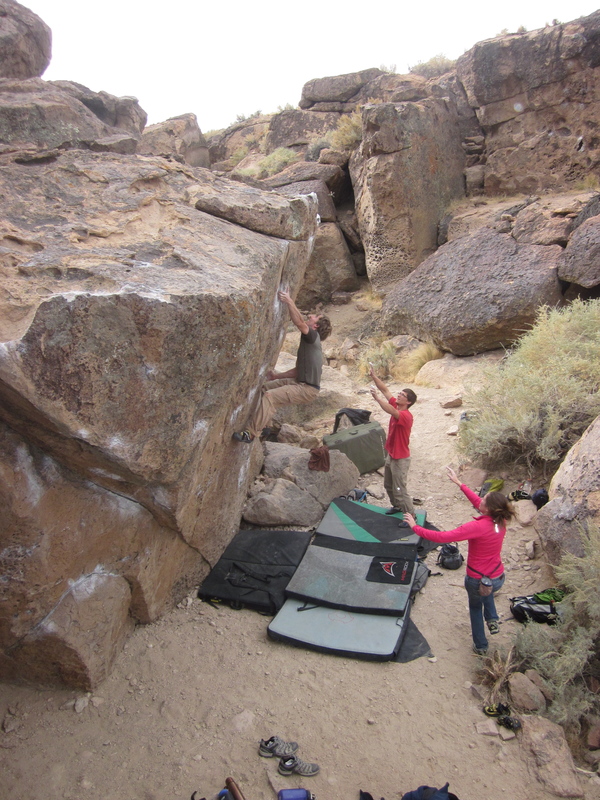 Bishop is probably America’s second most best bouldering destination next to Hueco Tanks, and has a top 10 sport climbing area in Owens River Gorge. The highest concentration of road bike climbs in America is the Eastern Sierra. Aside from Colorado’s Longs Peak, the Sierra has the hardest and best high-altitude (14,000′) rock climbs in the country as well. And Mammoth has California’s best snowboarding. The Eastern Sierra is paradise and Bishop is its capital. 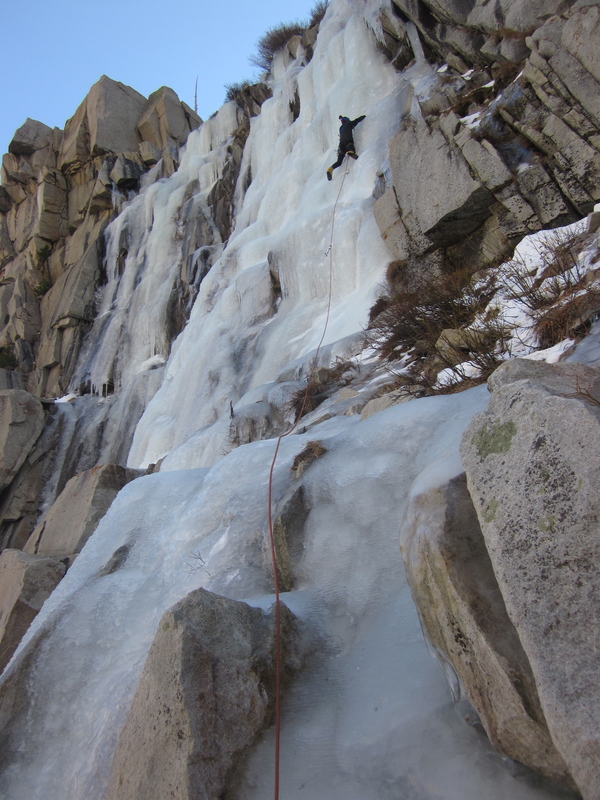 This trip my itinerary was ice climbing, bouldering, sport climbing and snowboarding. To people who don’t do these sports, they may sound similar to my normal activities: running, biking, mountaineering, trad climbing. But I assure you, bouldering is to mountaineering what 40 meters is to a marathon. Yes they are both climbing but they take a very different psychology and skill set. This Thanksgiving was the first weekend without any of my main activities since August, when I eschewed my usual sports and finally surfed Trestles during my recovery from Leadville. Surfing may be the most nature-friendly sport, if you use biodegradable wax. But main activities, like the ones I did this weekend, require tampering with nature, or are at least better when we do so. Running trails are man made. The Grand Canyon’s main trails, some of America’s finest, were built as mule trails for mining. Biking routes likewise. Even trad climbing routes are sometimes seriously altered (e.g. The Nose or Coarse and Buggy). Some crags are created entirely man made, like SoCal’s best sport crag, Riverside Quarry. I think only mountaineering is generally better when we leave it as it was, with no alteration from us. 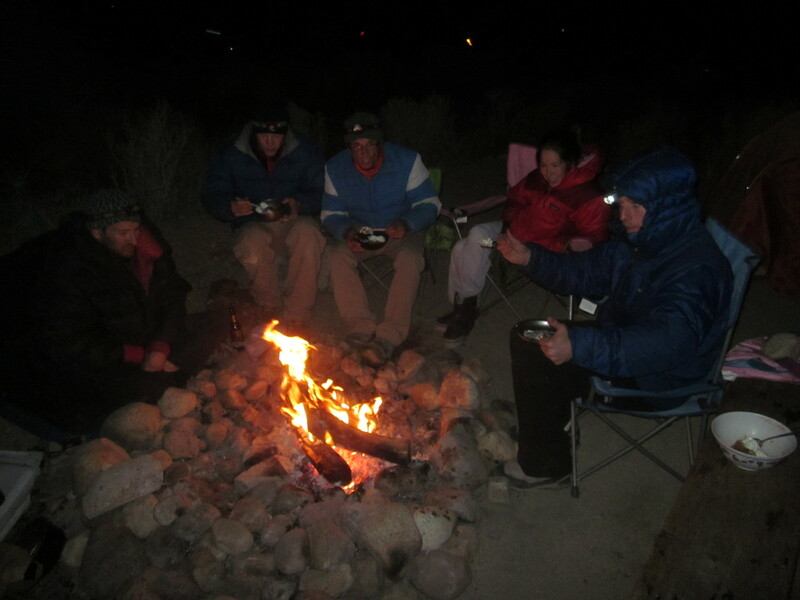 Thanksgiving dinner, camping at the Pit in Bishop. We had pumpkin pie and Konstantin even cooked a bird on the fire! Sometimes we wreck nature. Sometimes we access it. Sometimes we wreck it by hordes having too easy access (a pet peeve of mine, see my aforementioned post). And sometimes we might even inadvertently–or even purposely–make it more beautiful, like in the case of LA draining Mono Lake below the tufas. It’s one of many things to think about as I burn gasoline 800 miles r/t to the Sierra repeatedly in my quest to enjoy the earth and appreciate its goodness. Don’t burn yourselves out, be as I am. So get out there and hunt and fish and mess around. Run the rivers, breathe deep, that yet sweet, lucid air. Relaxing in a natural hot springs after a day of snowboarding at Mammoth. The water is volcanically heated but I’m guessing this pool was man made to accommodate dirtbags just like us. 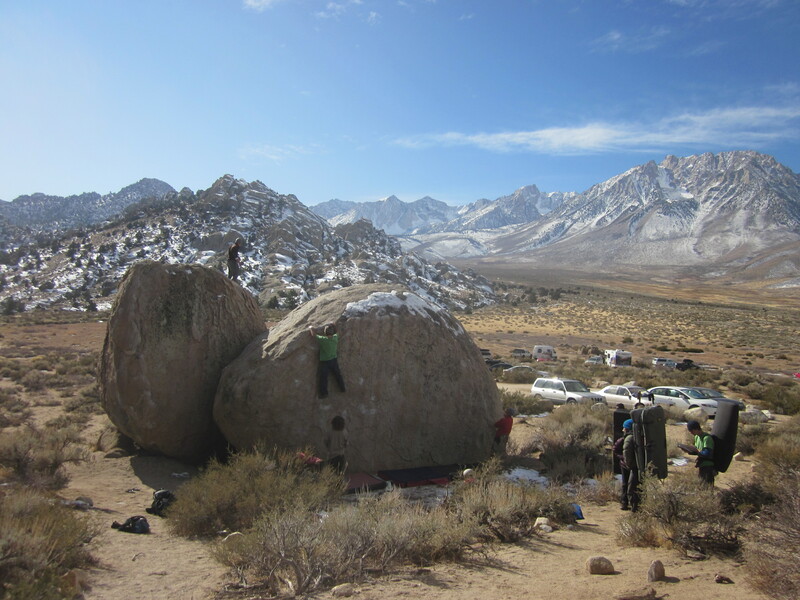 This entry was posted in Climbing, Great Nature, Pondering and tagged Bishop, Bouldering, Eastern Sierra, Lee Vining, Mono Lake, Owens River Gorge. Bookmark the permalink. It’s funny, the Sierra’s are where the two philosophies, protectionism and conservation, really developed with Muir and Pinchot, respectively. While Muir had an awesome spirituality, when it comes to land management I think Pinchot doesn’t get the credit he deserves. The other side of the issue is when we end up actually damaging nature by trying to protect it, most famously out West with fire suppression. We can’t help but alter our environment in order to experience it. For the outdoor sports we love, most of us want the wilderness to remain close to a natural state even though we have to modify it slightly to get the maximum benefit. There is no answer, only opinion. Personally I would like there to be areas of all kinds – sport climbing routes, well-graded trails, use trails, and untracked remote wilderness. I want to take advantage of all of these things. The Earth is in a constant state of flux, whether it is readily apparent to us or not, and I feel that for the lover of nature and wilderness it is almost a responsibility to enjoy it while it’s there. In a thousand or a hundred thousand years or a hundred million years, the lake will have dried up or changed beyond recognition and canyon walls will have caved in and the mountains crumbled to dust, and nature’s forms will live on only in the memory of a civilization that once knew it’s glory. I feel the need to add another comment – I had similar thoughts as you had a few weekends ago when I was hiking around Anza-Borrego with a friend. We were wandering through the slots and badlands in the area north of the Salton Seaway near the calcite mine there, and were struck by the impermanence and transience of the landscape, which is composed of essentially half-formed mudstone and sandstone, sometimes intruded on by strata containing smooth, rounded granite. I’m not positive about the geology but I believe most of the area was formed in the past several hundred thousand years, since the lake that once covered the area dried up only a few thousand years ago. The canyons were shaped and eroded into wild, sinuous and pocked forms by wind and water. It seemed that their walls crumbled to the touch, and even as we walked the wind exposed new strata beneath the surface. It seemed that the whole landscape would probably be gone in another few thousand years at the latest. It seemed we were living inside a brief flash in the incomprehensible vastness of geologic time; in the dissipating curl of a gust of wind. And within that moment, strange and spectacular forms grew from some just-formed layer of mud, twisting and curving in beautiful shapes – and then eroding and disappearing forever. And we were witness to it. It was a wonderful feeling. It made me think that it’s easy to find meaning and purpose in experiencing nature’s beauty as it exists today, because we are the only ones who can experience it as it is right now; those who came before and those who come after will lay eyes on a changed and different landscape. Anyways, what I should have said before that comment is that while I think it is alright to modify – at least only a little bit – the landscape in order that we may appreciate it more, I greatly prefer to witness natural forms in the purest, least modified state possible, and so I stand firmly in the camp that modification should kept strictly to the minimum which is “reasonably” necessary for it to be experienced within the constraints of our modern world of work and family and civilized life. I actually enjoyed reading this, thanks. Made me think a lot more about how much of the nature out there is touched by us. Even some of the most remote parts of Sierra have some trails (that I love). It is nice to have some harmony out there. Man made ice climbing is a great addition IMO. Brings a lot of business to Lee Vining, is very beautiful, and a fun hobby. Does not really alter nature aside from bringing people up to that canyon during winter months. As long as we respect, and do not trash these places our presence is not too damaging. Thanks for the feedback and education guys. I’m more with muir than pinchot, and more with abby (dynamiting trails to prevent overly easy tourist access) than muir. probably because I relate strongly to the spiritual side of nature. most of the development of wilderness I see as acceptable is in the way of enjoying it (hiking trails, etc), by those who are willing to put in the time to get there, not for resources. conservation is important in general but I think some areas–because they are very special–demand more. we dont need natural resources from every corner of the planet. and not every section of wilderness needs to be accessible by motor home. So I agree with the general sentiment you guys share, there is an appropriate place for a bolted sport wall with an asphalt road going up to it as well as a no-fly zone wilderness like the Wind Rivers. Another good example is the smokey mountain np. In the south smokies, there are gaggles of tourists at the road observation points. in the north, there are no roads, just trails and the views are even more incredible. so everybody can be more-or-less happy. I also agree with Greg–the least intrusion is best, especially in delicate areas like the high mountains. Wilderness means wild. Keep it wild.